When I was planning the menu for this lunch, I was originally wanting the dessert to be based on some sweet pancakes that I have that could do with being used. They were spread with an apricot puree and rolled up to be baked or fried later. The semi-freddo was to be vanilla to accompany the pancakes, but once I started to make it and sweetened it with a richly flavoured rosemary honey, the recipe went off in a totally different direction. The pancakes were delicious fried in butter a couple days later. Always buy honey from as local to you as possible and honey that has not been processed or pasteurised. It is more expensive, but has so superior a flavour to the supermarket honey that it is worth it. My current favourite which I buy in the weekly market in my village of Vera, is made from the pollen of rosemary flowers. It is dark and not overly sweet with a deep flavour to match the colour. Beat together the mascarpone, cream, honey and vanilla. Heat the butter on a low heat in a shallow pan. Add the walnut and stir round to warm. Sprinkle over the sugar and stir to mix. Continue cooking and stirring until the sugar is starting to caramelise. Remove from the heat and let cool a little. Add to the cream mix and stir in. The cream mixture will have been quite thick before and the addition of the nuts will make the texture thinner. Don’t panic this is OK . Put in the fridge until quite cold. Stir to lift the walnuts from the bottom of the mixture and distribute them evenly thoughout the mixture. Pour into your pre chilled containers and put into the freezer until nicely solid but not rock hard. It is purely the colours in this sauce that have earned it its name. Yellow saffron with black and red fish eggs. The green being provided by beans to accompany. I started with a whole salmon and having removed the fillets made stock from the head and bones. The stock I then reboiled and reduced by half to concentrate the flavour. I let it cool completely so that I could remove any fat from the top. Dry the saffron in a thick based shallow pan over a low heat. This will not take long and will burn easily, so as soon as you get a faint odour of the spice, whip it off the heat and into a mortar. Add a small pinch of salt and grind to a powder. Add a ladle of the stock to the mortar into which the saffron will dissolve. Return this to the rest of the stock. Add the fish eggs and put to one side while you cook the salmon. Put the teaspoon of cornflour into a small container and add just enough cold stock to make a thin cream. Fry the salmon in a small amount of oil over a medium heat for about seven minutes each side until nicely browned. Put on a warm serving dish and keep warm while you heat the sauce. Drain any excess fat from the frying pan and add the stock sauce. Heat quickly to boiling. If it is a bit thin then thicken with the cornflour mix, stirring the mix first to make sure that the cornflour is evenly pourable. 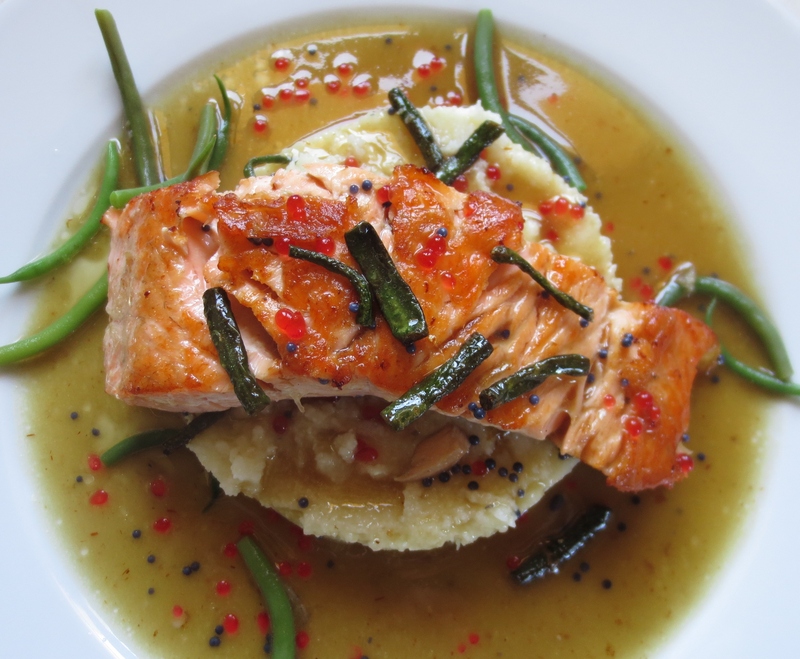 Serve the salmon on a bed of white polenta or creamed potatoes surrounded by the sauce and some steamed green beans. I never think of salad combinations as being recipes, but I suppose they are really. 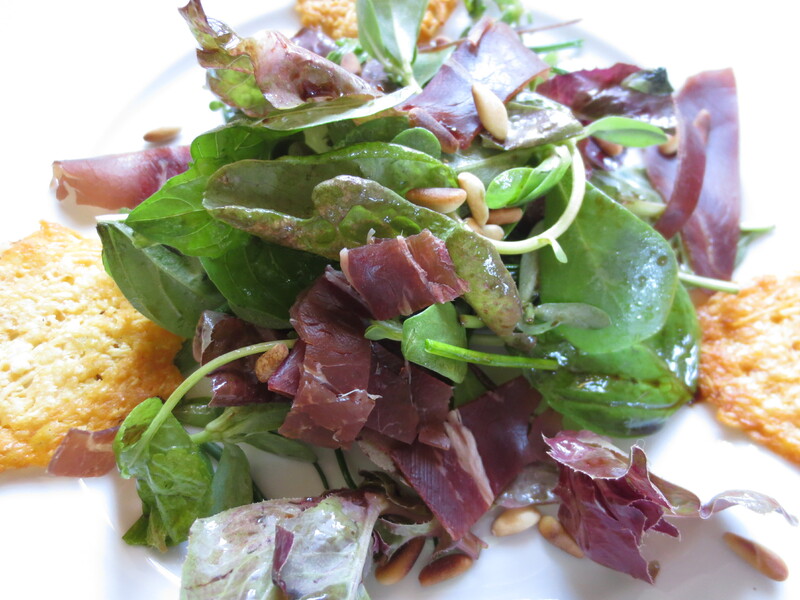 This salad uses most of the ingredients in Pesto which we all know complement each other perfectly, and adds cured beef – Bresaola in Italy and Cecina here in Spain. The salad leaves of course are grown on the farm. If you have a plot on which to grow your own vegetables, look out for seeds for Basil Lettuce, the large leaves are milder in flavour than the usual sweet basil, so perfect for salad. It is very happy in the summer heat, but you do have to keep cutting it to encourage the large tender leaves. of course a smaller amount of sweet basil leaves can be used with salad leaves if basil lettuce is not available. Make the parmesan crisps. Heat the oven to 180 centigrade. Line an oven tray with baking paper then using a small round pastry cutter, spoon the grated cheese into the centre and pat down with a teaspoon to make even depth discs. Bake for 7-10 minutes until golden and bubbling. Remove from the oven and let cool before removing the discs from the paper. When they are completely cold they can be stored in an airtight container for up to 24 hours. Toast the pine nuts. Use a thick based shallow pan on a low heat and keep moving the nuts around until an even golden colour. Toasting the nuts really brings out their flavour. This can be done several hours in advance. Put the salad leaves in a large bowl and dress with the olive oil, lemon juice and black pepper. Toss well. Add the pine nuts and toss again. Put onto individual plates and lay over strips of the cured beef. Decorate with the parmesan crisps. Every few weeks myself and some girlfriends get together to have lunch and exchange books that we can recommend to one another. 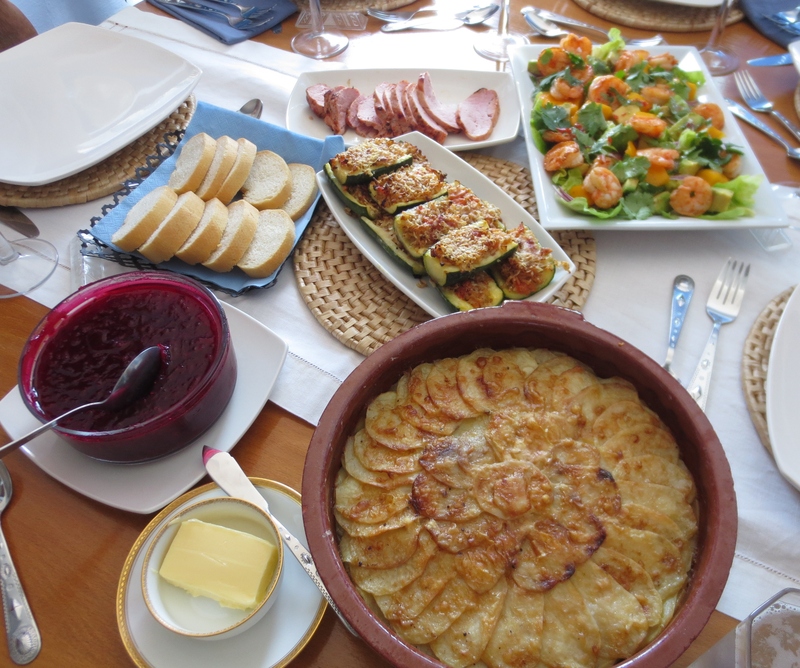 What started as a literary meeting with lunch has now evolved into a culinary exchange as well. Each person contributes a dish, and with the minimum of consultation it all works well together. 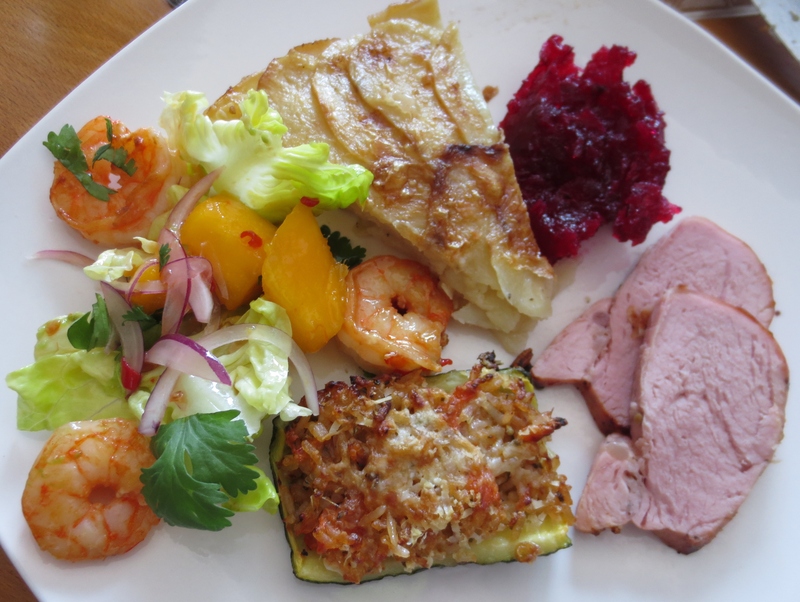 This week our hostess Doris decided to salt a loin of pork for the lunch and suggested I bring a potato dish. I immediately thought of Potatoes Anna. Similar to the better known Dauphinoise, but lighter and with a flavour as strong as the cheese that is used in it. Lynda made a tangy salad of prawns, mango, red onions and leaves, dressed with sweet chilli sauce and lime. Corrine courgettes with a spicy rice and tomato stuffing. A beetroot jelly to go with the ham completed our main course. All delicious. Dessert was a plum pie made by Pat served with vanilla ice cream. Peel the potatoes and slice as finely as you can. A mandolin or the slicer on the food processor is ideal for this. You will need a shallow oven proof dish of the size suitable for the number of portions you are making. 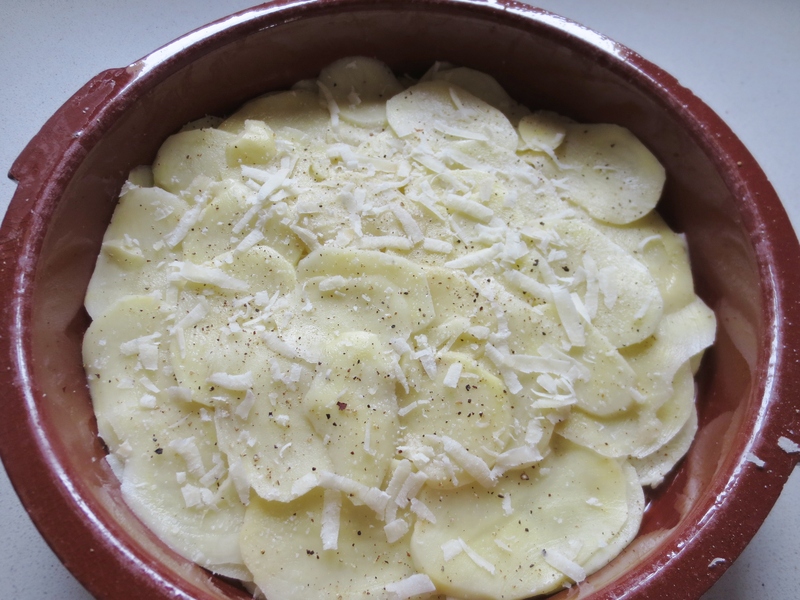 Lay a single layer of slightly overlapping potatoes in the dish. Season with salt and freshly ground black pepper and grate over a thin layer of cheese. 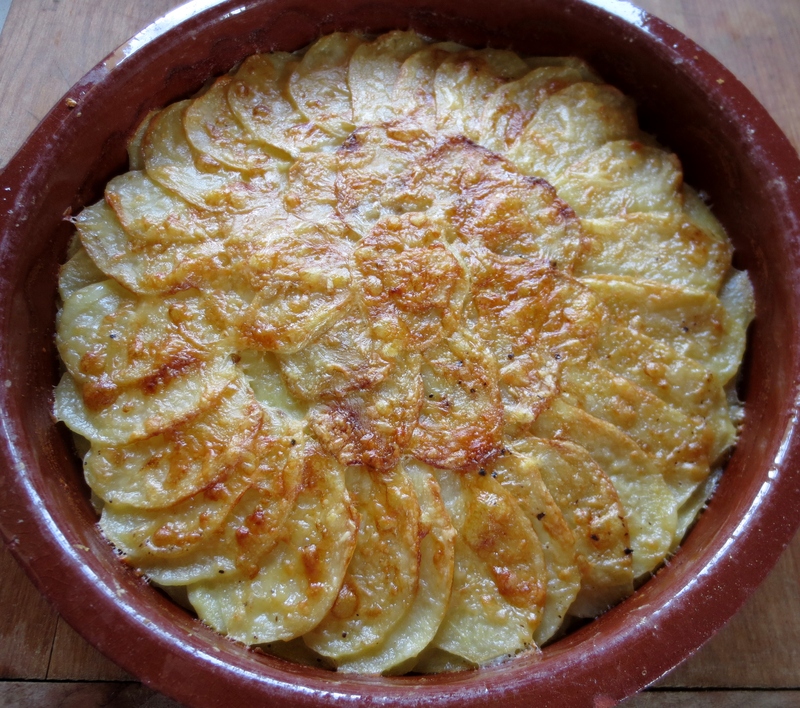 Continue with the layers of potatoes, seasoning and cheese. It is worth at this point putting on one side enough nice evenly sized slices for the last layer. On the last layer concentrate on prettily overlapping the potatoes. Don’t season straight away. Heat the stock until simmering. Pour over the potatoes until just level with the top layer. Season and spread a thicker layer of cheese onto this last layer. Cover with tin foil and put in an oven preheated to 200 centigrade. Bake for 30 minutes. Remove the tin foil from the potatoes and put the dish back into the oven for a further 20 to 30 minutes until golden brown. Let rest in the dish for 10 to 15 minutes before serving. We have the first Yard Long Beans of the season ready in the garden. I get excited about these because even though in appearance they look like an extended French bean, the flavour and particularly the texture are quite different. These beans have a crunchy and crispy texture even when cooked, and a fresh flavour. 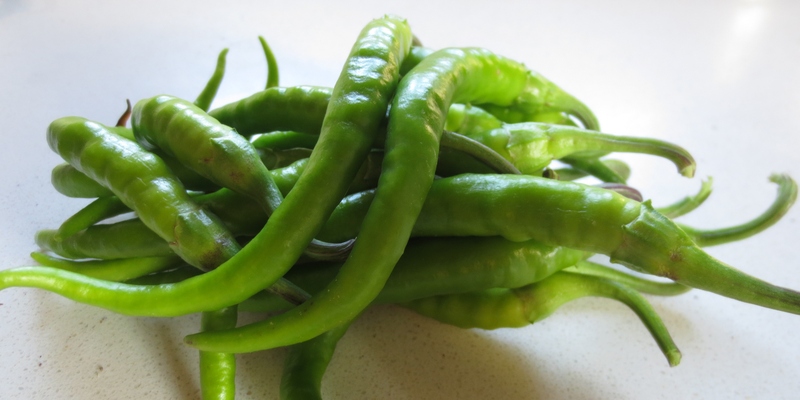 The other crop now ready are the pale green mild chillis. I can eat these straight from the plant and they are super pickled in mild vinegar. I have to cook a dish that can use both of these ingredients. I bought a fresh pineapple in the market this week, and that reminds me of a fish dish that I had in Thailand some years ago. It was spicy and sweet and a little bit sour from the pineapple. Here is my recreation of that dish. Start with the aromatics, peel and finely chop the ginger and garlic. 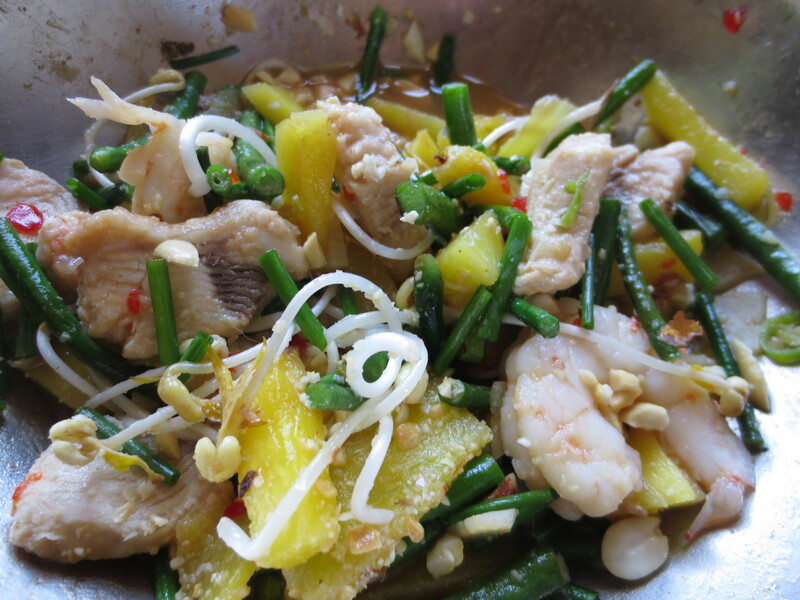 As thin as you can slice the lemon grass and chilli. Prepare the fish. Peel and dehead the prawns, cut the fish into chunks, steam open the mussels if using them. Heat some oil in a wok and add the above aromatics. Cook on a low heat for a few minutes. Next the pineapple, cut out the woody centre and cut the rest into smallish pieces. Add to the pan and continue cooking . Add the yard long beans cut into 3 cm lengths. The pineapple by this time should have given out some of its juices. Add to these the fish sauce and chilli jam and mix in. Add the fish, stir to mix with the sauce. Cover and leave to cook for five minutes. Stir again and look at how cooked the fish is. It will most likely need a few more minutes but be careful not to overcook. To serve, sprinkle with the crushed peanuts and chives and serve with plain boiled rice or noodles. If you want you can mix these into the pan of fish and pineapple to absorb the flavours in the sauce. The almond crop is in for this year, and of course I want to eat some straight away. It has me thinking of dishes using almonds. There are several Spanish sauces that use almonds as one of their main ingredients. Romesco Sauce is a blend of red peppers, both sweet and picante and garlic, thickened with almonds and balanced with red wine vinegar. It is served with fish or grilled vegetables. I went off to the market to buy fish, but the rabbit looked so plump and tender that I ended up coming home with one instead of the fish. 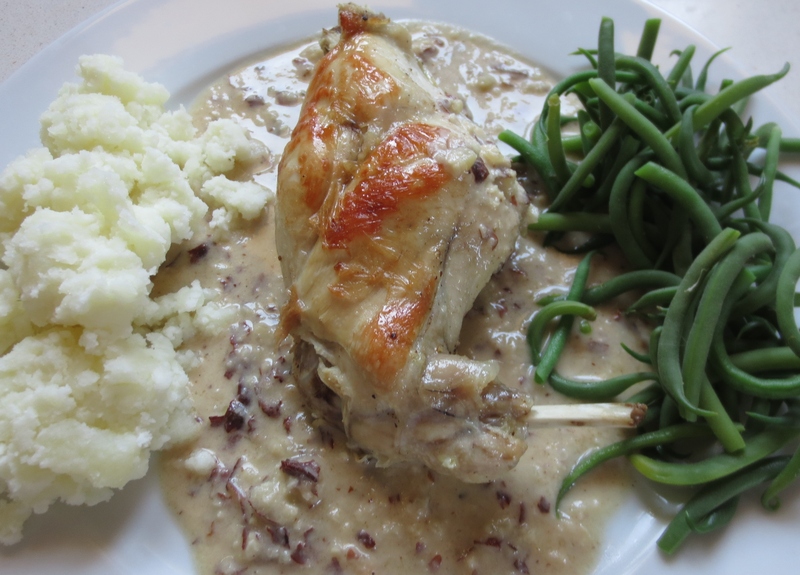 Rabbit with Almond and Garlic Sauce is what I am planning to prepare. this richly flavoured sauce is super simple to make. Generously season the rabbit on all sides. Heat some oil in a shallow pan and when hot add the rabbit leg. Fry until golden and then turn to fry the other side. Meanwhile peel the cloves of garlic and add to the pan. 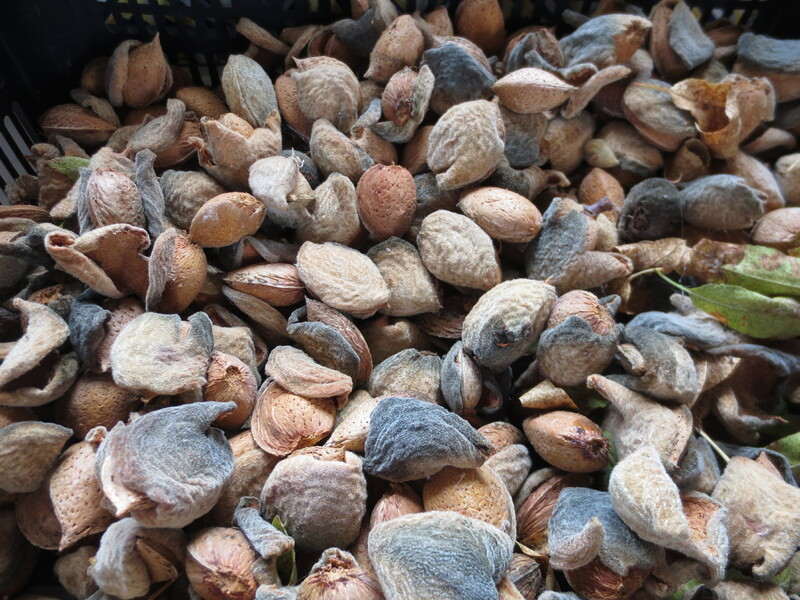 Next the almonds, these can be blanched or left with the brown inner skins on. Add these to the pan. When the rabbit is nicely browned on both sides add about two tablespoons of water, cover the pan and turn the heat very low. Leave to cook for 20 minutes. Turn the rabbit over and cook twenty minutes this side. Remove the rabbit from the pan and keep warm. Put the juices from the pan together with the almonds and garlic into a food processor and whizz until smoothish. I like to leave a few bigger bits of almond in the sauce rather than have it super smooth, but it is up to you how smooth you want to make the sauce. Return the sauce to the pan and reheat. Serve poured over the rabbit leg. In August the fig trees are so replete with fruit that the birds and I between us cannot eat them all. Caramelised Fig Jam has been made, kilos of fruit have been dried, some figs have been transformed into chutney, and as many as one can eat have been eaten – with Ham, with salty cheese, in salads and just on their own. I have successfully used them to make a Fig Tart – you will find the recipe for that in a previous post – but need a new dessert recipe. This experiment was a success and as the August figs are so sweet, doesn’t need any added sugar. The key to getting it right is not to be afraid to keep cooking. If you stop cooking too early the figs will not have a caramel flavour, so if you let them cool a bit and taste them and they don’t seem done enough, don’t worry, just put them back on the heat and cook some more until they have a faint caramel aroma and a stickiness where they are in contact with the heat at the bottom of the pan. 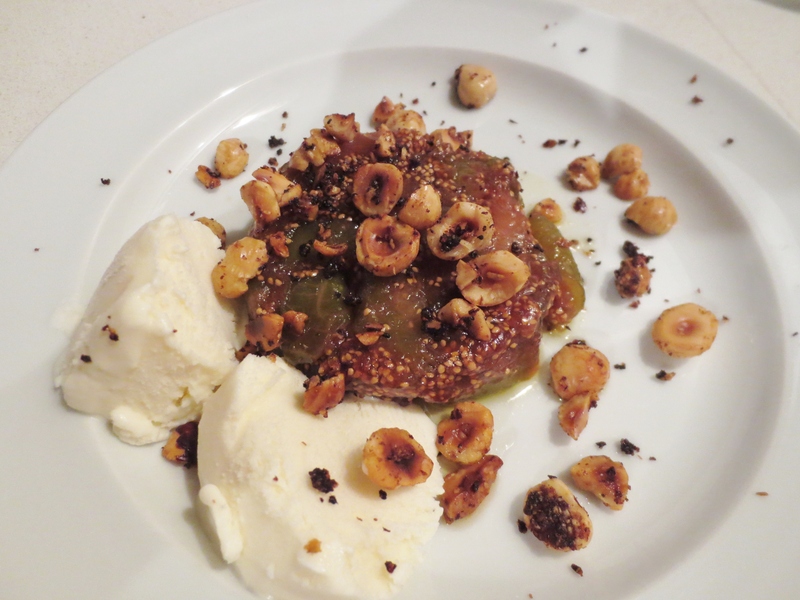 I have now made this dessert twice, and the second time served the figs still warm with fresh cream and the warm toasted hazel nuts, which was very good too. Wash the figs and dry them in a tea towel. Cut off the stems and cut the figs into quarters. Warm the butter in a non-stick frying pan and add the figs. Cook stirring on a medium heat. The fruit will start to give out some of its juices, continue cooking until these have evaporated. Keep stirring and cooking until the fruit mixture is dryer and is frying in the butter. The sugar in the fruit will now start to get hotter and be heading towards caramelising. Keep cooking until you can detect the caramel aroma. The fig mixture will get dryer and tend to stick to the bottom of the pan a bit, but keep going until they are nice and toffee flavoured. Do not be tempted to taste the figs at this point, they are very hot. Leave to cool until warm. Put into ramekin dishes and smooth the tops. Leave to cool to room temperature. In the frying pan toast to golden some broken and crushed hazel nuts. Leave to cool to room temperature. When ready to serve loosen the fig mixture from the sides of the dishes with a knife, put a plate on top and upturn the whole to end up with the fig compote on the plate. The butter should stop the fig mix from sticking to the ramekin. 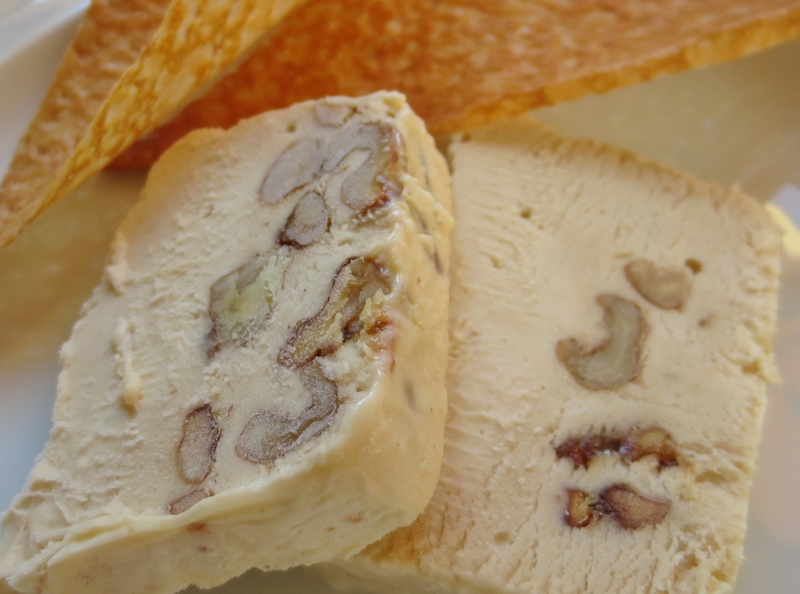 Serve with ice cream and the hazel nuts scattered over. It is a warm summers evening and I have friends coming for dinner. I am in the mood for something spicy and hope that my guests are too. 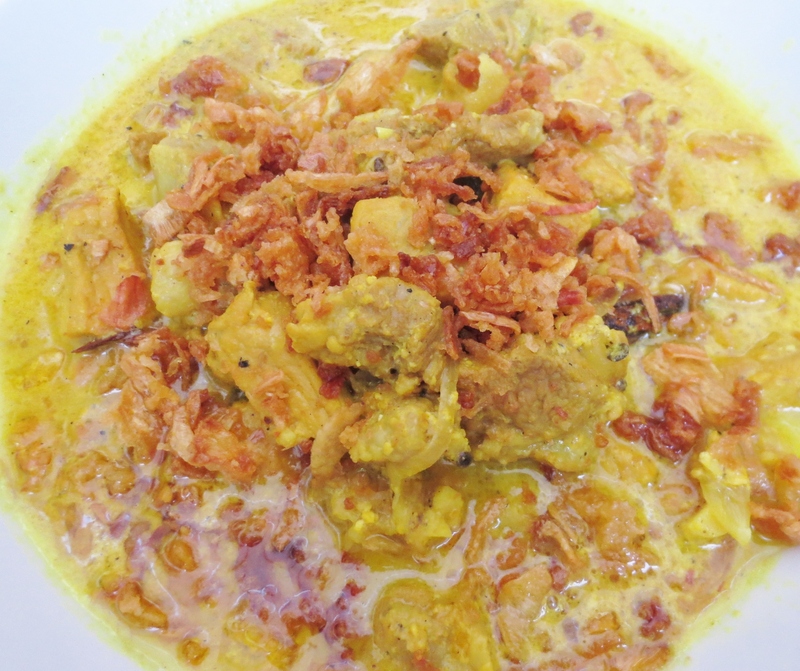 I have a piece of loin of pork that I was going to salt to have as ham at a future date, I recall this recipe for pork cubes in a creamy sauce flavoured with honey and citrus, spiced with cinnamon, cardamoms and turmeric. I cooked far too much rice yesterday, there may be enough, if I add some chick peas there will definitely be enough. I will fry some red onions and garlic, then add the rice and chick peas to heat them through. A garnish of chopped chives should finish off the dish. A vegetable dish then. Not in a sauce as I already have one, and picante seeing as the sauce is mild and sweet. I have in my minds eye those lovely spicy vegetable fritters that you get in Indian cooking, but I want to make them lighter and less calorific. 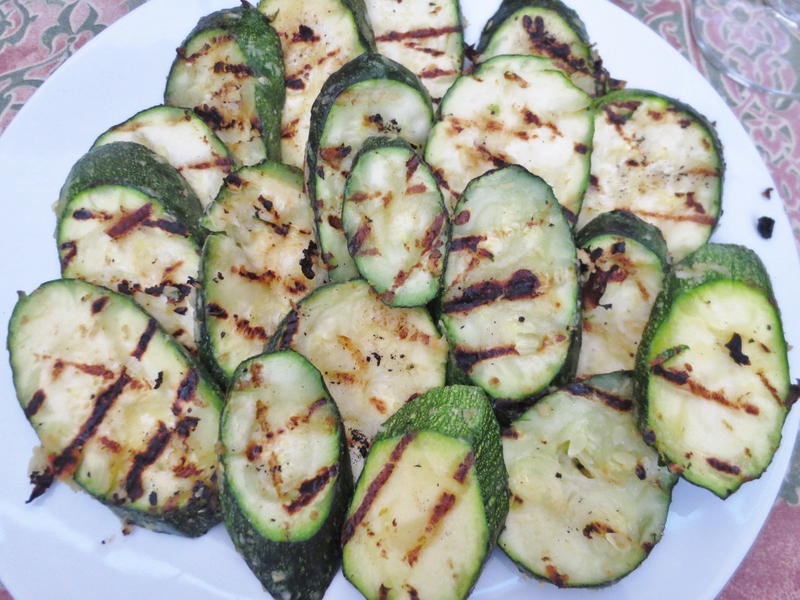 I have some courgettes fresh from the garden, in slices they will absorb the flavours of a marinade, then I plan to dust them with Gram flour and grill them. 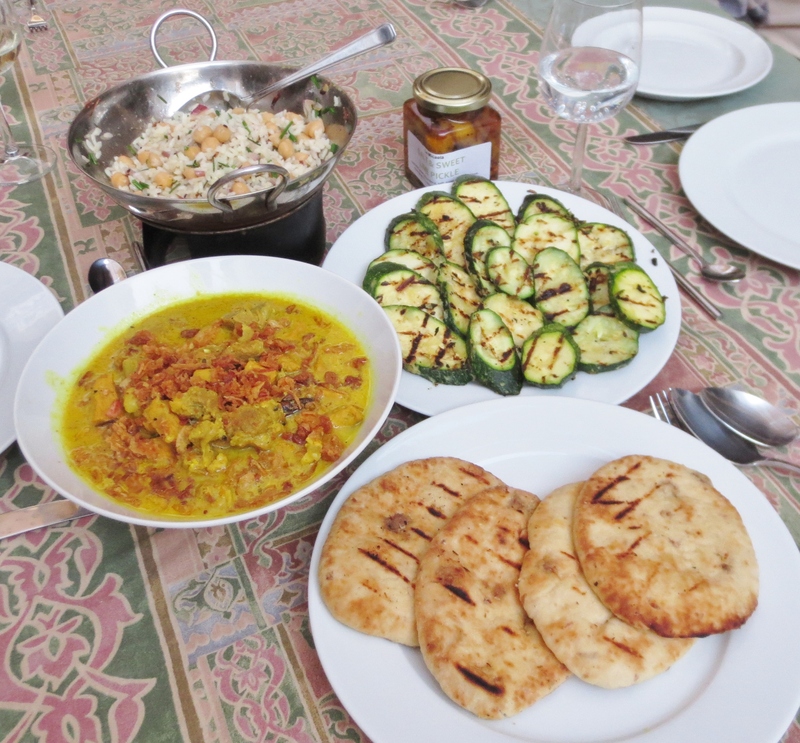 Some Nan bread and Sweet & Sour Lime Pickle from the farm shop will complete the meal. Peel the onion and cut up into small pieces. Put in a shallow pan with the garlic and half the butter. Fry until just starting to brown. Put in the honey and continue cooking until the honey is thickened and starting to caramelise. Add the pork cubes and the rest of the butter. Cook until the pork is sealed and browning. Stir in the turmeric and cardamoms. Add the yogurt and stir in. Add the cinnamon and the strips of peel – use a potato peeler to remove the strips from the fruit. Lower the heat to the minimum, cover and leave to cook for about 20 minutes. The dish can be cooked in advance up to this point. To finish peel and slice the second onion. Fry rapidly in butter until browned and dry. Rewarm the korma if you have cooked in advance. Add the cream and continue cooking to thicken the sauce. You can remove the pieces of peel and cinnamon at this point in you want to. Garnish with the chopped fresh coriander and the fried onions. Chop the garlic and put it into a mortar with the salt. Mash to a pulp. Grate the ginger into the mortar and mash to blend with the garlic. Add the marinade to the courgettes and mix to make sure that the slices are evenly coated with the marinade. Leave to let the flavours seep into the courgettes for at least an hour. Heat a griddle or thick based non-stick frying pan. Dust the courgette slices with gram flour and grill or dry fry until turning from time to time until browned and cooked but still with some bite.